This was awesome when you fixed it at my house forever ago! Thanks for posting – I had forgotten about this and had to go get broccoli today so I could have it tonight! How did it turn out? I can’t believe that I forgot about this little simple gem. It’s a crime. PS Can’t believe you read my blog. 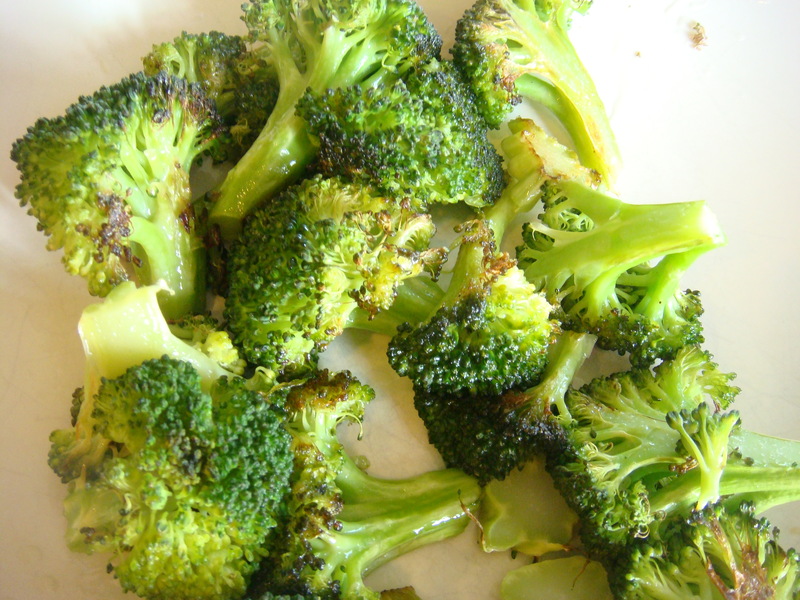 I make broccoli similarly… I have oven roasted it before, but I usually put a bit of water in a pan (about 1/4 cup), along with a bit of olive oil, sea salt and 2-3 minced garlic cloves, then “steam” them, boiling until the water is evaporated, about 5 minutes. When you hear the olive oil start to sizzle, remove the pan from the heat. That sounds good too. Do you get the yummy lightly browned part on it this way? I love that part. Roasting seems to intensify the sweetness of most veggies. I keep meaning to post a recipe I have been using all week for roasted garbanzo beans. They are roasted with a morrocan spice mix and olive oil. Super good, filling and crunchy. Oooh, I would like that recipe. I have tried roasting garbanzos… three times… four times… something like that. I have started w/ ones that I’ve soaked from dried, and ones from a can, and used three separate recipes, but I can never seem to get them to the right CRUNCH. They’re more like super-hard, or slightly-moist, neither of which is satisfying. I’ll try to post it soon. I agree with the crunch thing. The first time I did it I liked the consistency better. The second time they were too crunchy. Like teeth breaking crunchy, but tasty.